Most poker players scream “one time” for that one shot at glory and a major poker title. 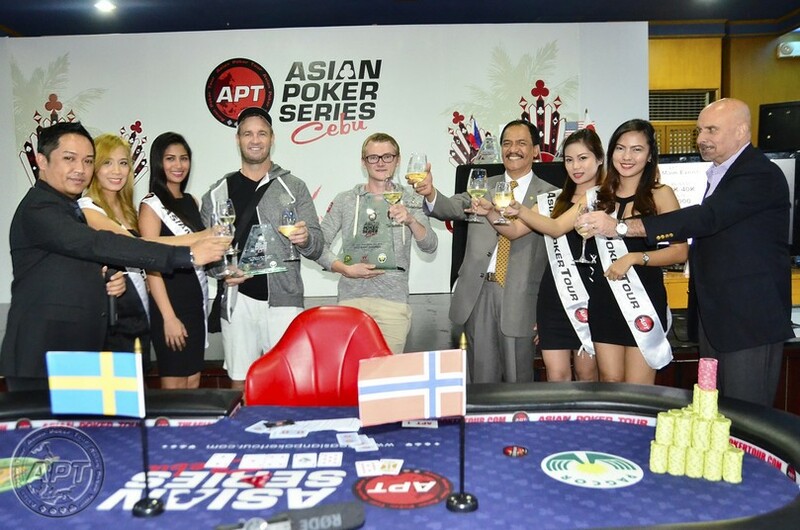 Henrik Tollefsen of Norway has doubled up on every poker players’ dream as he became the first-ever two-time Asian Poker Tour (APT) main event champion after winning the APT Asian Poker Series Cebu 2015 Main Event on Tuesday. Tollefsen beat Swedish Roger Spets in the heads-up round of the final day of the main event held at the All In Poker Club at the Waterfront Hotel and Casino Lahug in Cebu, Philippines. Tollefsen, who had a dominating lead in the head-to-head round or about 2.5-to-1-chip lead, won holding K♥ 10♦ and was up against Spets’ Q♥ 10♥ with the board 2♣ A♥ 4♦ A♠ 8♦ holding up for the eventual champion. 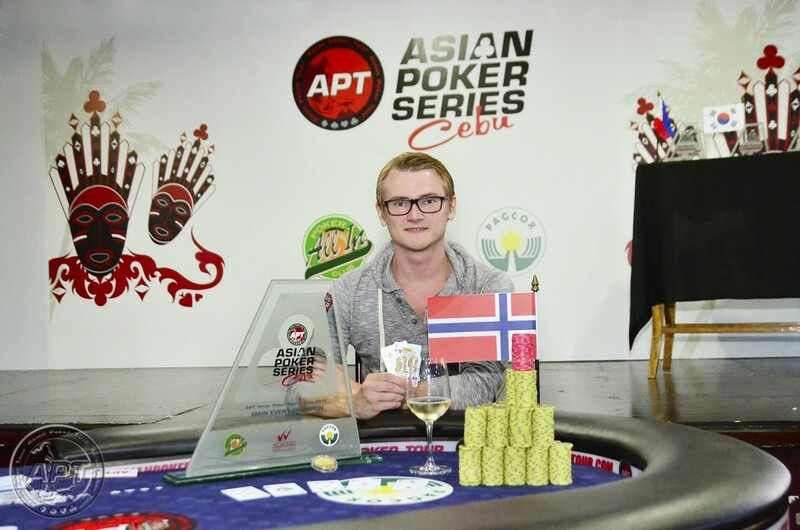 For his championship effort, the Norwegian added another PHP 1.72M (or roughly $37,100) to his bankroll. Two years ago, he bagged the APT Macau 2013 Main Event title. “I think that’s really fine. I thought someone else have won two already. So yeah, I am very happy about that,” Tollefsen said about his two APT main event titles. When asked to compare this win to his past accomplishments, particularly the one in Macau, Tollefsen said, “Every win is special” adding modestly that his “luck has been very good” lately in tournaments he joined. 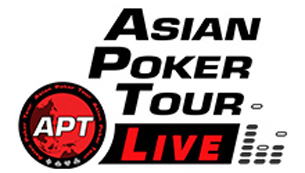 The third-placer is Japanese pro Iori Yogo, who at a time had the slight chip lead when play was three-handed. However, Tollefsen beat him in some big pots including Yogo’s final hand; the Japanese shoved with just eight-nine on a board of A♦ 10♥ 9♣ Q♣ for a mid-pair and gut-shot straight draw. Tollefsen made the easy call holding A♥ 9♥ and no jack saved the Japanese on the river. Tollefsen also eliminated fourth-placer John Graham from the United States. The American shoved with king-queen and got called by Tollefsen, who was holding the ladies and with no king appearing on the board. Two interesting stories in the final table action involve the two Filipinos—Edwin Marzan and Ian Brion— who were looking to bag the APT title in their own backyard. However, the poker gods had clear plans that no local will be able to win the title in this APT stop. In Brion’s bust out hand, the Filipino flopped the straight holding 10♦ 8♣ with a board 9♦ J♣ Q♣. By the turn 5♦, Brion and his opponent, Yogo were both all-in. Yogo’s pocket nines trailed Brion but a nine on the river gave Yogo the quads to bust out the Filipino. Eerily similar is the fate of another Filipino in Marzan. In a pre-flop all-in, the Filipino shoved with A♣ 10♦ after being raised by Tollefsen, who had 5♦ 6♦. The eventual champion called anyway to bring the flop 3♣ 4♦ 10♠ giving the Norwegian new outs. The turn A♥ didn’t change anything but the river 2♦ completed Tollefsen’s straight eliminate Marzan. The main event is over in Cebu but there are two more side events on tap on Wednesday; the 6-Handed Turbo (PHP 11,000 buy-in) and Deep Stack Turbo 3 (PHP 5,500 buy-in) events set at 1:00 PM and 4:00 PM, respectively.